The 2017 AFL Season is well underway with Round 2 quickly approaching. Another AFL draft period passed, and the team at Rookie Me are ecstatic with the outcome of draft selection in the industry. As the Official Talent ID Partner of the AFL - we celebrated our Company's involvement with some of the newest AFL recruits. As known to many AFL enthusiasts, there are official AFL Draft Combines held for nominated athletes (capped at around 180 athlete participants). However, our sporting nation produces many more talented footballers; whom, may not have had the opportunity to showcase their ability at either of the State or National Draft Combines, due their own circumstances. Therefore, Rookie Me provides a "draft chance" - an opportunity for eligible athletes of drafting age, to participate at the annual Rookie Me Combine. This unique opportunity was presented to Western Bulldog's Lin Jong; and became an aspect of his pathway to play AFL. Please see the full interview, as presented by Ben 'Dicko' Dixon, click on the link provided. Athletes who participate in our combine, have the opportunity to demonstrate their athletic fitness ability, in a controlled and non-biased environment. On behalf of each individual participant, Rookie Me submits a detailed player profile to every AFL Club. Another highlight for athletes trying to make their mark in the industry, is that the talent and recruiting managers from AFL Clubs are also present at the Rookie Me Combine event, witnessing the athletes perform first-hand. AFL's National Talent Manager, Kevin “Shifter” Sheehan, explained during selection night, that Greene was, “not in the 180 we tested, and through Rookie Me they have another testing day” he was selected. National Draft Selection 2016, Western Bulldogs. Source: Youtube: https://youtu.be/d78drwdLhdQ Take special note of Pick #28 and #70. 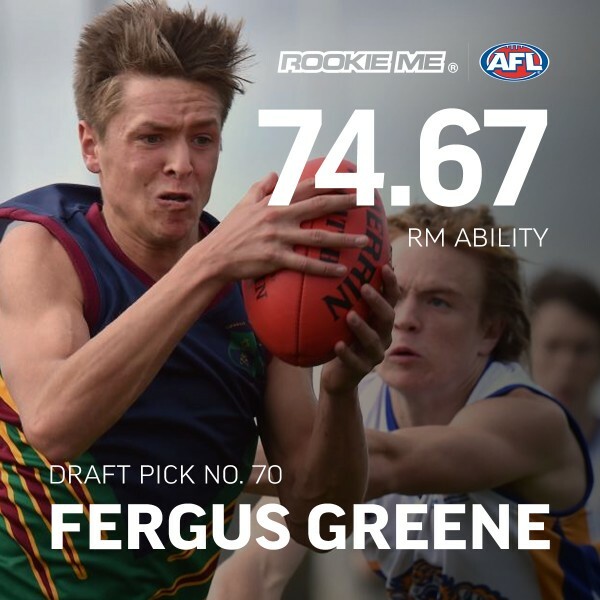 Fergus Greene was definitely identified as an elite athlete from the moment he began testing at the 2016 Rookie Me Combine. Declan Keilty was Rookie selection #41 during the draft period; and was a standout participant in the 2016 Rookie Me Combine. Not only does Rookie Me offer an annual combine, which may increase an athlete's chance to be drafted, but it also hosts an online system, which represents the individual athlete. This dynamic online tool provides Australian Rules footballers amazing perks, not only does it allow potential talent to have the chance to Be Recognised, it also creates an understanding of the fitness levels and athleticism required, to play at an elite level. Athletes are able to compare themselves to fellow Aussie Rules athletes, current AFL footballers and RM Ambassadors nationwide (who are featured on the system), in an equal-level playing field. If you are a budding footballer and what the edge on your competition; and to stay on the Rookie Me radar visit www.rookieme.com and find out how! The RM Academy is providing the ultimate pathway in athlete growth and development for Australian rules athletes (male and female) nationwide. The RM Academy operates a set of age-specific programs: Junior, Pro and Elite. 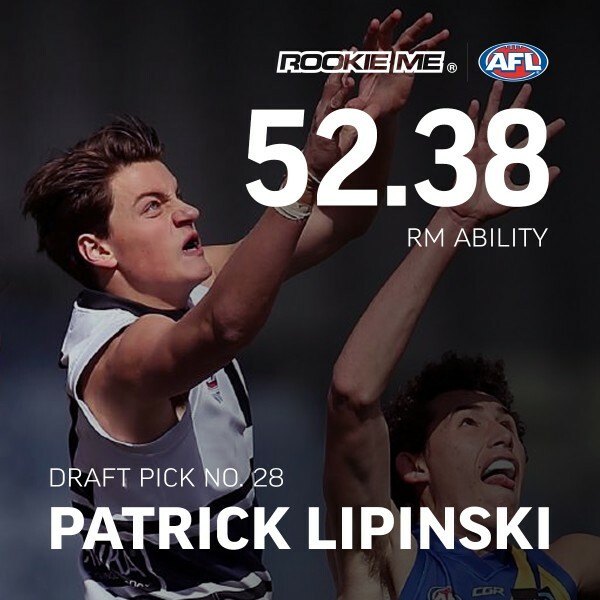 The Rookie Me team are extremely proud of Patrick Lipinski, and want to recognise former RM Academy athlete and Northern Knights footballer, selected as pick #28 in the AFL's Draft selection by the Western Bulldogs. Patrick Lipinski. Source: RM Media. "The 18-year-old Eltham product is a former basketballer whose number one asset is his clean hands but is also composed under pressure and can run all day." - as cited via . Patrick Lipinski is an absolute champion both on-and-off the football field! When participating in the 2016 National Draft selection at Etihad Stadium, he took time-out of his schedule, to address current RM Academy athletes at our September/October camp; and share his personal journey. The team at Rookie Me encourage all young athletes interested in playing elite-level football to utilise our services. The Rookie Me team thank all our young athletes who have trusted and believed in our services - and we look forward to kicking goals in 2017! If you would like an opportunity to submit a blog to Rookie Me News and for it to have the chance to be published, please send your blogs/writing pieces through to tammy@rookieme.com with your contact details!